How has your week been? Have you eaten anything delicious? I've had an awesome week so far. It's been filled with insane food and loads of fun. It's one of those weeks where you can focus on one of the most important fall holidays known to man, or to food bloggers, that is. Thanksgiving! Sure, I may be going a bit overboard as far as important holidays go, but I love Thanksgiving. I love the all of the homemade food (I really do go a little crazy menu-planning), getting together with family, and appreciating the little (and big) things in my life. Yes, this year may be a bit untraditional, but I'm still going to satisfy my cooking, and especially baking fix. 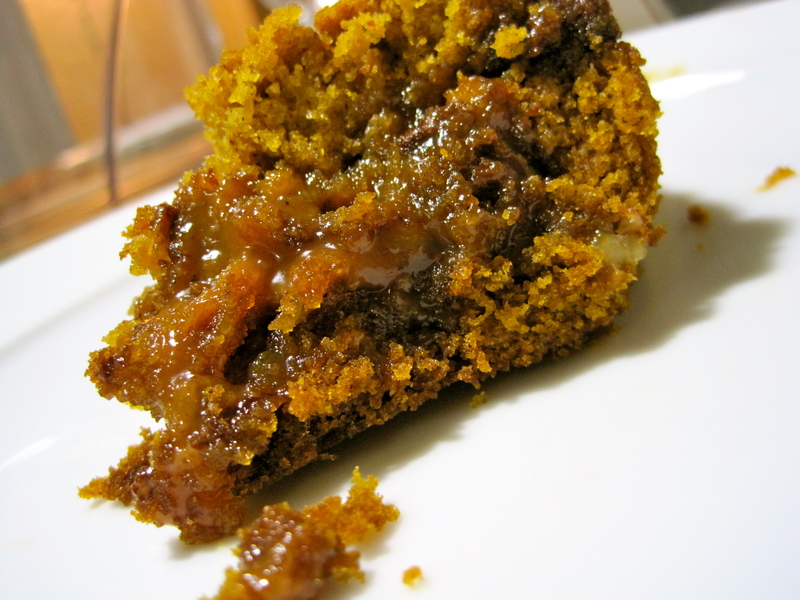 I made this pumpkin "cake" several weeks ago, and I hate that I haven't shared it with you sooner. I say "cake" because the original recipe says that this is a blondie bar. However, I didn't have the correct dish and decided to wing it. The texture, with an 8 x 8 baking dish, at least, was definitely on the cake-y side, but I think it will be delicious either way. It has a light pumpkin flavor and a hint of spice. 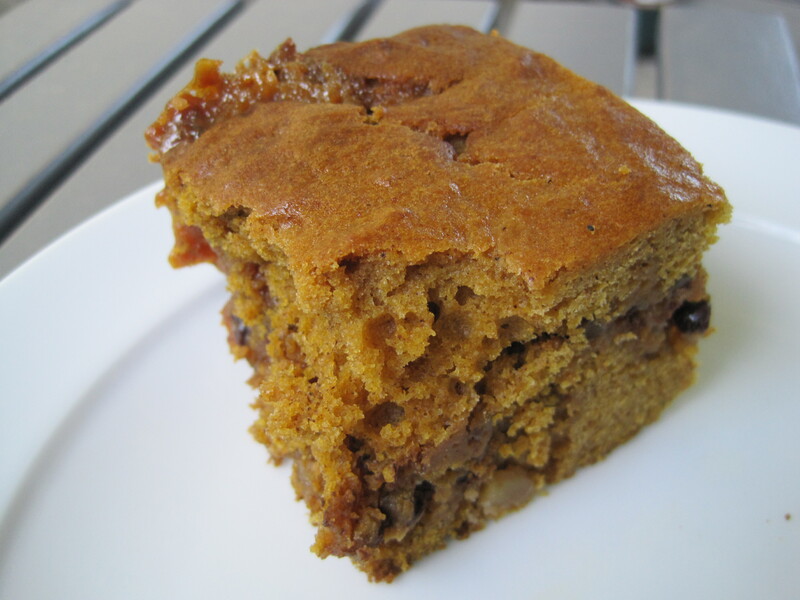 Perfect for fall or a pre-Thanksgiving snack? This is definitely ooey-gooey. There is a thick layer of creamy caramel oozing out of the center. Incredible. I honestly can't think of anything better than butter and brown sugar mixed together... Maybe chocolate and peanut butter... maybe. 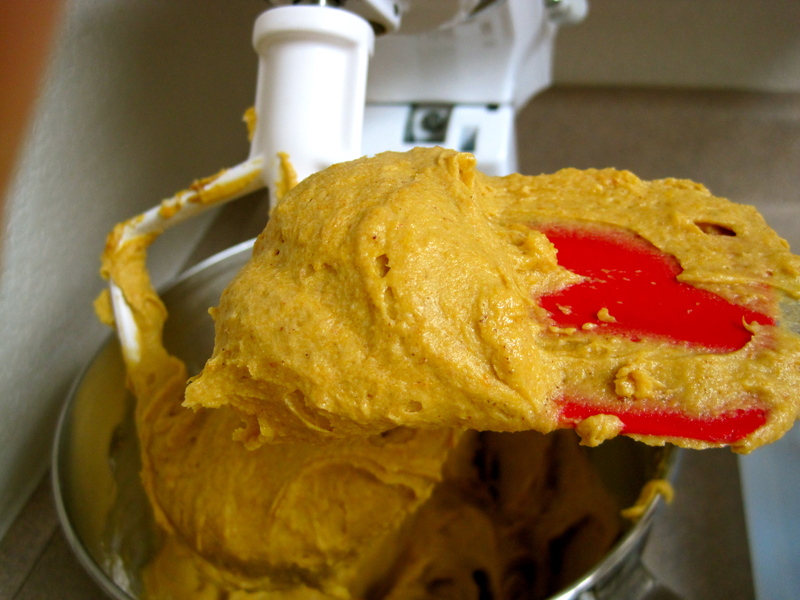 The batter is thick and smells heavenly like pumpkins and spice. Yum! I mentioned above that I used the wrong size pan, but I was still happy. The only downside was that the top got brown before the inside was cooked. I'd recommend covering it with foil about half-way through it you want to go the 8 x 8 dish route. If you are preparing it the right way (in the 9 x 13), you shouldn't have to worry about over-browning though. Unwrapping an entire bag of caramels! I am fortunate enough to have a lovely, amazing friend who enjoys doing this for me. I use the word "enjoy" loosely though. A bit of heavy cream and a microwave and you have the most amazing, gooey bowl of love and sugar. 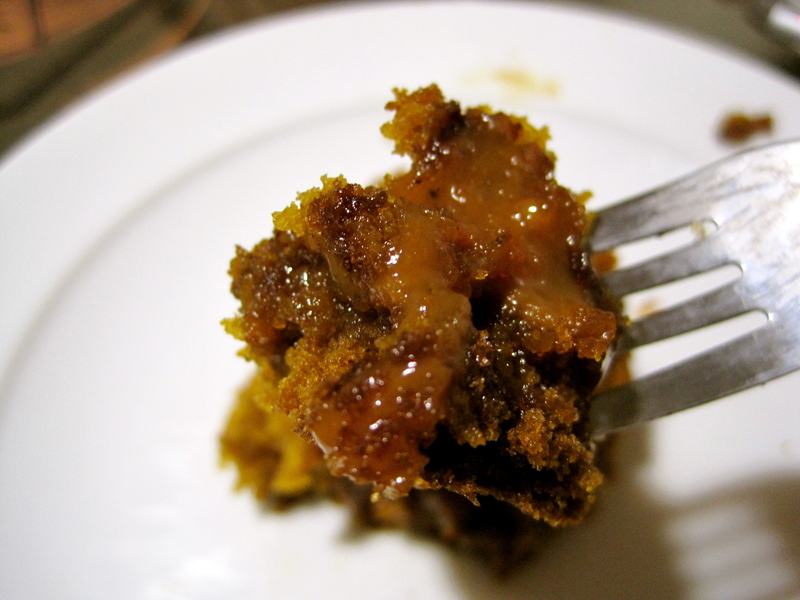 Plus, the dripping caramel TOTALLY adds to the dramatic effect of this dessert. 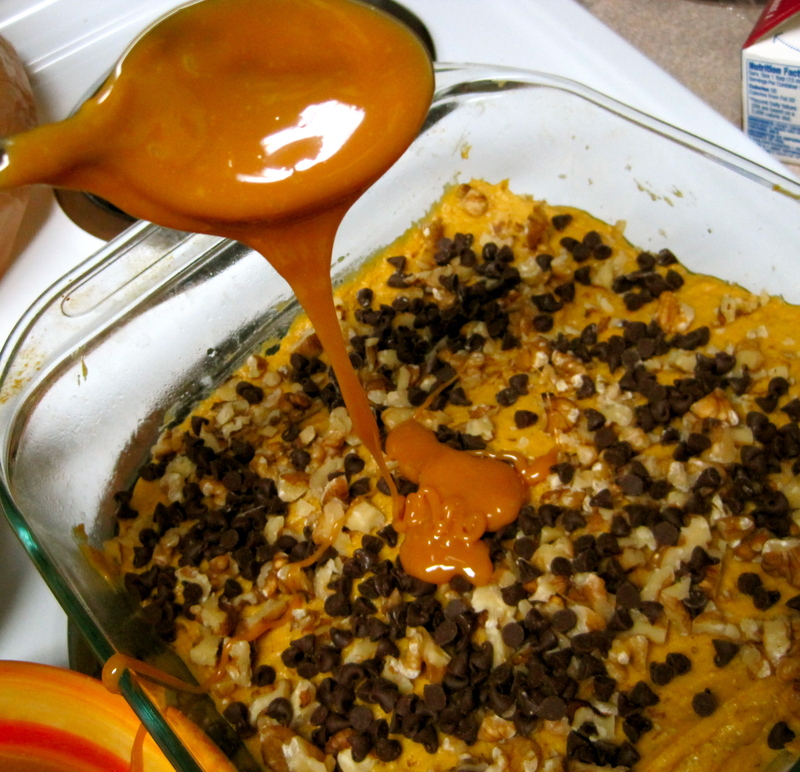 The first layer of the batter is generously covered with chocolate chips, walnuts, and caramel. The amazing center definitely turns up the yum factor on this cake. The caramel is an insane, sticky, delicious, wonderful mess on your plate, but in a totally perfect way (unless you refrigerate it). 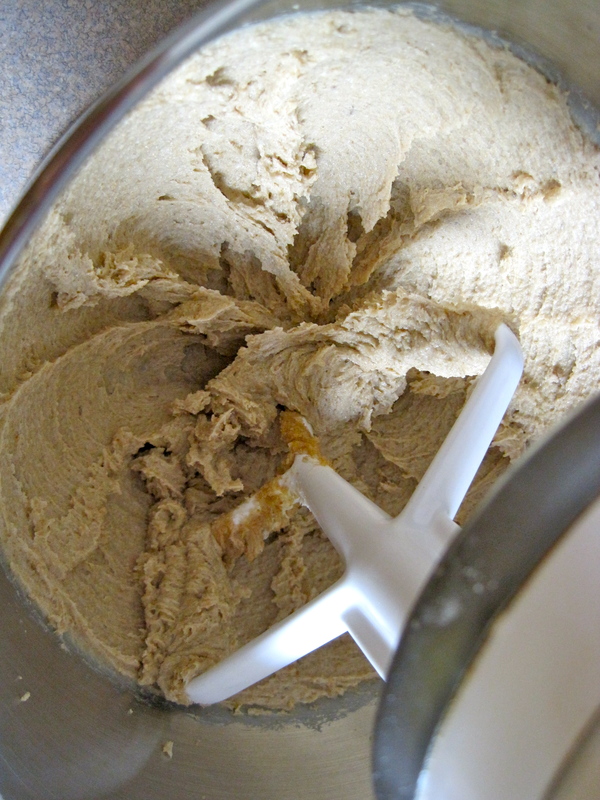 In a mixer (or large bowl) cream together brown sugar and butter on low-medium speed until light and fluffy. 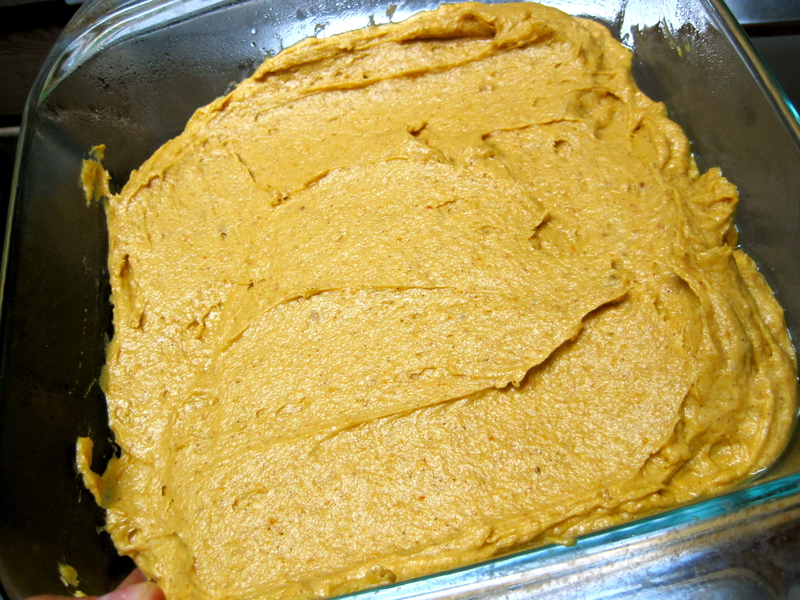 Add eggs, vanilla, and pumpkin puree, stirring on low until combined. Slowly add cinnamon, nutmeg, flour, baking soda, and salt, folding with a spatula until combined. 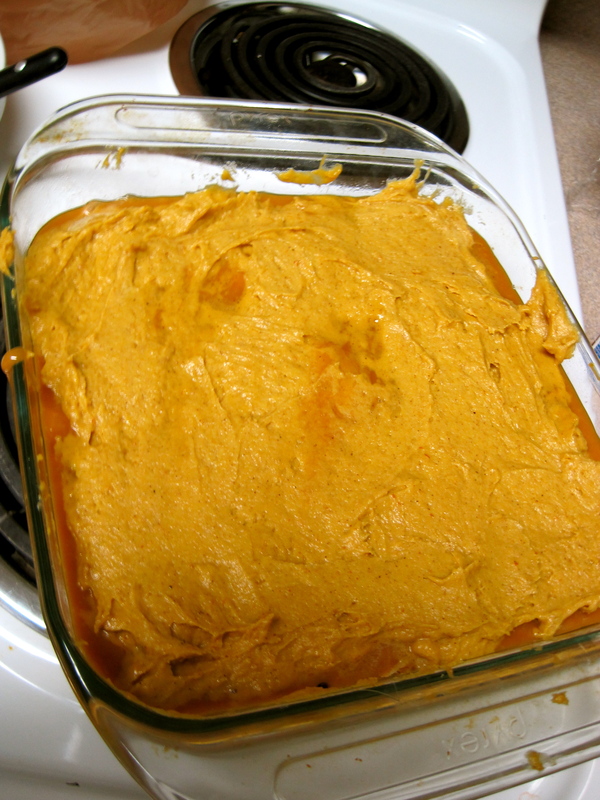 Spread 2/3 of batter into prepared pan and set the rest aside. Sprinkle chocolate chips and walnuts over the batter in dish. 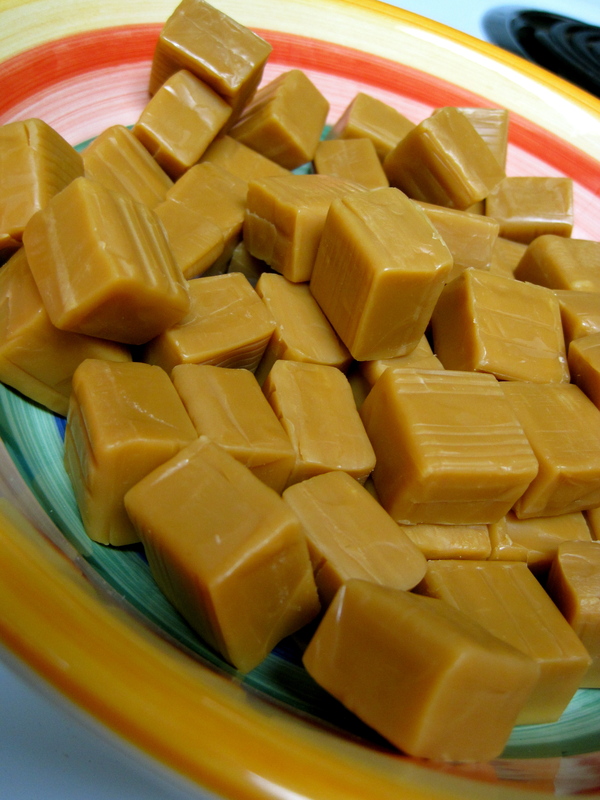 In a microwave-safe bowl, heat caramels and heavy cream in 20 second intervals, stirring after each, until melted. Stop once the caramel is melted and smooth. Pour ooey, gooey caramel over the chocolate chips and walnuts, spreading with a knife or spoon until even. 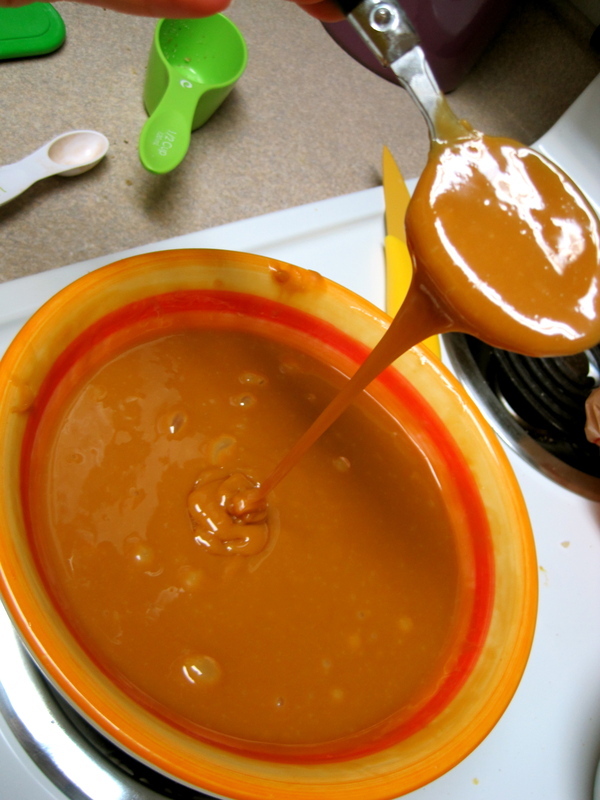 Spread remaining batter (in dollops) over the caramel layer, smoothing with a knife or spoon. 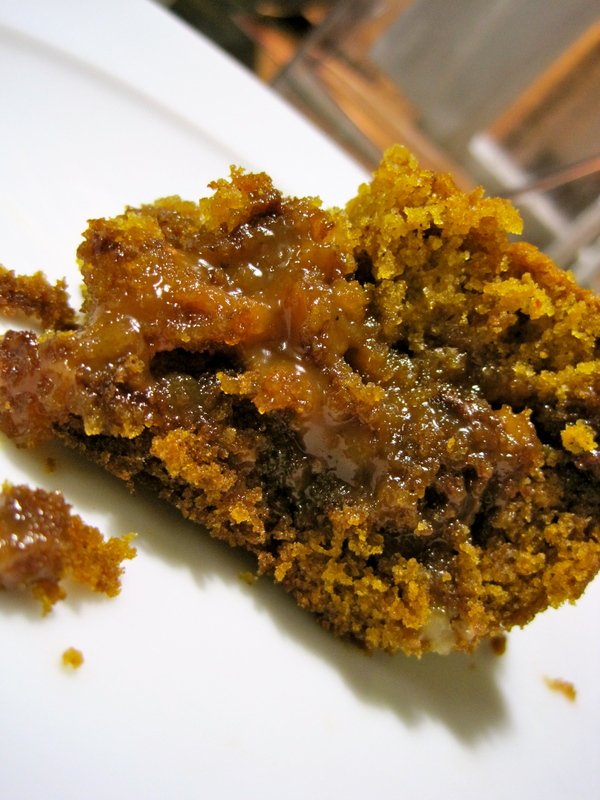 Some of the caramel may ooze through, don't sweat it; it will taste that much more awesome. Cool completely before serving. 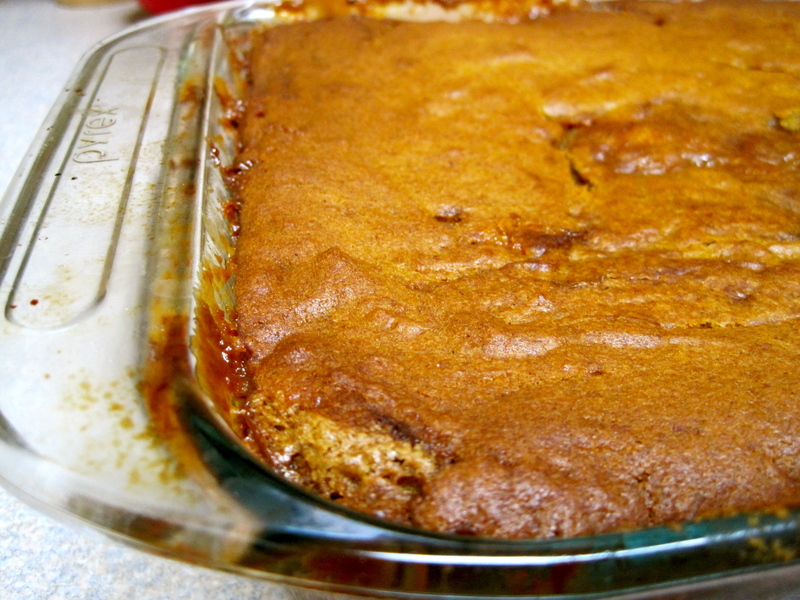 It will be very caramel-y and oozy if you serve it while warm. Serve with ice cream, whipped cream, or enjoy all by itself.